The attention of travelers is drawn to the fact that their presence is required at the airport two hours before the scheduled departure time. Most companies close their check-in counters 60 minutes before departure time. Once registered, it is also advisable to immediately go to the boarding lounge for police formalities that can be long if several departures are planned. Arriving passengers must count an average of 20 to 30 minutes to complete the formalities of police and customs and to retrieve their luggage. 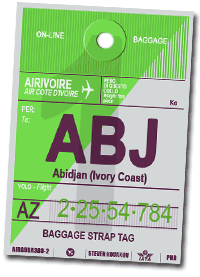 Entering the Ivorian territory by the international airport of Abidjan requires for travelers other than Ivorian citizens a passport valid more than 6 months after passing the police station. In addition, nationals of certain countries (Europe, America, etc..) must obtain a visa in the nearest consular representation. WARNING: bi-national passengers who can not prove their Ivorian nationality (passport or ID card) are also subject to visa requirements. Pets accompanied by a recent health certificate and special permission from the Commissioner of Customs will be allowed. Rabies vaccination must be at least 1 month and max. 1 year prior to arrival. Airlines are particularly demanding on the allowed weight of luggage. To avoid problems at check-in counters, it is expressly required for travelers to check before their arrival at the airport if their baggage do not exceed the permitted allowance. In this case, expensive and non-negotiable luggage fees may be asked. In addition, it is recalled that the luggage must be strong enough to be handled and transported. Plastic bags are prohibited because they tear easily. The yellow fever vaccination is required to enter the Ivorian territory (the vaccination certificate indicating your protection against yellow fever is required). Pregnant women are reminded that airlines each have a specific policy on the duration of pregnancy not to exceed to be allowed to travel. From the 7th month of pregnancy, flying may be prohibited or a medical certificate may be required. Please check with your airline to avoid being denied boarding. Some products can not cross borders on arrival or departure without special authorization. This is the case of animal remains, live animals and certain items of historical heritage of Ivory Coast. Thank you to contact the Veterinary Services or the Ministry of Culture if you have any doubt about this type of product . Hazardous products (firearms, explosives, corrosives, pressurized container, etc.) are generally prohibited or regulated. Thank you to contact your airline to find out its policy on the transportation of these products. Furthermore, a strict control of drugs is carried out by airport police officers. The canine brigade, through its specially trained dogs to search for drugs in luggage, allows regular cocaine seizure. Moreover , the mere consumption of cannabis can lead to penalties of up to 6 months in prison. Searches can be performed randomly on passengers.